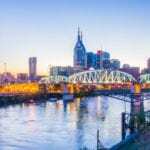 NASHVILLE, TN — Public service is something many good people avoid these days, unwilling to deal with the demands, low pay, and hassles that are a routine part of the job. But that has never been the case with District 1 Councilman Nick Leonardo. Just last week he was gathering signatures for easements in the Bordeaux Hills neighborhood, accompanied by his six-year-old daughter Adriana, as part of the campaign behind a $3 million dollar storm sewer project. His efforts were aimed at preventing another disaster like the one that occurred in 2010, when the neighborhood was ravaged by flooding. “Dad, turn that up,” Adriana requested from the back seat. Like a good father, he dutifully cranked up the volume on the car radio. Indeed, his willingness to listen and help is a familiar attribute that is frequently repeated in his interaction with the people in his district, Leonardo listens and when he thinks he can help, usually does. He arises daily at 4:30 a.m. and seldom arrives back home before 8 p.m. Leonardo is also a partner in an East Nashville law firm, and most mornings will be in court. That’s followed most afternoons and evenings by attendance at committee or council meetings in City Hall. As the councilman for some 20,000 constituents in Nashville’s largest district, Leonardo’s kept quite busy. “I have an inordinate amount of community meetings here and Scottsboro as well as Joelton. If you do it the way it’s supposed to be done it’s a fulltime job,” he responds when asked how he balances such a busy and hectic schedule. It is this devotion to detail and duty, along with his non-stop desire to help and serve his constituents, that has earned Nick Leonardo Tennessee Tribune’s recongition and selection as our 2017 Councilman Of The Year. His position has certainly proved advantageous in utilizing his degree from Nashville School of Law. But no one should let his congenial attitude and popularity obscure the fact that Leonardo has a keen and inquisitive mind. “We pay General Hospital for the cost of providing service to the inmates or to those who are in custody,” was City Attorney Jon Cooper’s answer. The translation of this is if the cops arrest and beat you up, the city foots the hospital bill. An East Nashville resident, Nick Leonardo hardly had an easy road to success. He took the number 22 (Scott) and four (Shelby) buses respectively to Father Ryan high school, where the desire to serve others and help those less fortunate was a regular part of the lessons he learned along with the basic curriculum. Upon coming to the council, Leonardo brought plenty of vital experience that included 15 years of negotiating plea bargains, divorce settlements, and personal injury lawsuits. There was both a thorough knowledge of real world issues, and a realization that courts don’t dispense justice without there being an advocate willing to fight for it. In fact, Leonardo’s publicly said that’s a role he enjoys. whether it comes in the courtroom for a client or as the voice of his constituents on the council. Shortly after Mayor Megan Barry was elected, Leonard met with her to discuss key issues and things he considered important in his district. She in turn sought help on votes for agenda items she deemed essential. “And she said, ‘Well, lets talk about that’ and within the next 30 days they approved it. I’m certainly grateful to Mayor Barry,” he added. It was a prime example of the fact Leonardo has strong principles, the main one being an advocate for his district. Yet, he’s also a realist, and politics is the art of the possible. “A lot of times things have overwhelming support. I might not necessarily agree with what they want to be done, but I’m not going to waste a “No” vote and go against the administration if they’ve already got 27 votes,” Leonardo said. Though he hasn’t been on the council a long time, Leonardo’s already learned the wisdom of carefully picking your battles. “If you get on the wrong side of this administration, or any executive branch, they can make it more difficult for you if you want a land swap in Bordeaux Hills or if you want certain things like this storm water project,” Leonardo said. Leonardo sometimes gets impatient with the pace of problem solving as a Council member. But at 41, he’s far from jaded or cynical, and often adopts innovative solutions to get things done. For instance, recently Metro Storm Water sent out easement agreements for residents on Panorama Drive to sign so the project could begin. Three residents didn’t mail them back. Not wanting to delay construction “for who knows how long” Leonardo knocked on doors last Monday to get the easement papers signed and the digging started. He wants the work completed by next Spring. “Here’s the first one,” Leonardo says. The house belongs to Roy Ewing, an Elder at the Mt Zion Baptist Church. They talk a bit, then Ewing signs the papers. Leonardo reaches the owner of the second house on the phone. She has the papers in her purse, but is at work. They arrange to meet later at Leonardo’s law office. The third house presented a problem. It belonged to a dead person. The owner died, but didn’t leave the house to her son, who subsequently later died. Now the son’s wife is living there. Legally speaking, she is squatting. Leonardo gets her on the phone and explains she is not in trouble, and he can get the title to probate in her name so she can sign the easement papers. Leonardo is not required to come by or help the woman. But he will handle the estate pro bono. Fortunately, Metro legal later found an easier way. Instead of putting the house through a probate hearing, the woman could just execute a right of way on the property. Even though this wasn’t something he was required to do, Leonardo’s half-day’s work helped put the sewer project on line.“Because I’m a lawyer I end up using those skills to make things happen in the district or make things happen for people,” he says in assessing the situation. Things like this have become commomplace every month since Leonard joined the Council in August 2016. He researches the law, department rules, and carefully examines anyone who raises objections to things he wants to push through the council or a committee. When he encounters opposition to a proposed bill, objections at a meeting, or obstacles to a planned objective, Leonardo goes back to the drawing board and finds another way to move things ahead. He has been remarkably successful for a first year councilman. “I bet I get 50 phone calls a day dealing with council issues,” says Leonardo. A lot of those calls are from developers. 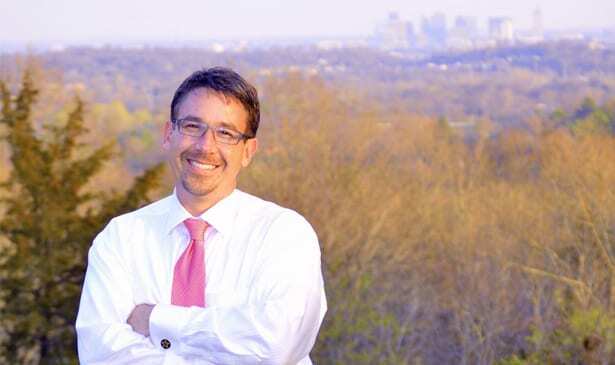 District 1 is the biggest district in Nashville with the most undeveloped land.The most powerful thing you have as a councilman is that you control development in your district,” he adds. This is another area where Leonardo’s integrity and resolve have earned him plaudits, his dealings with developers. In his regular meetings with them he makes it clear that he won’t rubber stamp or operate in lockstep with their every wish. This is no short fight, nor is every battle easily won. Leonardo’s been fielding angry calls for months from residents near Cumberland Elementary School. They are upset because heavy trucks turn off Ashland City Highway to dump construction debris on land owned by a Mt. Juliet man. This individual is “grading” his land off Cato Rd. Leonardo said he has counted the number of trucks on the road and they rumble loudly by every minute or two. He’s talked to the owner who said he and his wife were building a horse farm at 4604 Cato Rd. The permit they obtained from Metro to grade the land was properly obtained. The man told Leonardo they would be finished soon. That was a year ago, and a legion of dump trucks still drive past Cumberland Elementary everyday on Cato Rd, which has no sidewalks. He has called the owner of Crystal Farms a “bad actor”. What do you do when what the bad actor is doing is perfectly legal? You make it illegal.,” is his suggested solution to this problem. Leonard adds that the same thing is happening over on White’s Creek Pike in his district. Now he has plans to address this via the law. Leonardo has a bill coming up for a final reading November 7 that allows a councilperson to request a public hearing about a grading project. If a permit is more than six months old, or if a building permit has not been issued within six months on the property, and if offsite waste is being brought and stored on the site, then the Public Works Committee can recommend suspending a grading permit. “My hope is that you call these people on the carpet and you say, “Come on now, you are not building a horse farm. Let’s be honest here’.” He has another piece of legislation pending that will restrict the amount of inert waste that can be dumped in rural areas. It won’t affect building downtown. The new ordinance will still allow grading, but projects must get council approval for a permit and Leonardo hopes that will stop Public Works from rubber stamping grading permits for horse farms that are actually dump sites. He also said he would like to see District 1 considered for the new pro soccer stadium. Meanwhile, there’s another pending event that could affect Leonardo’s future plans. Nashville Criminal Court Judge Randall Wyatt Jr. retired September 1, and he’s one of three finalists who might replace him. The other two candidates are Cynthia Chappell and Angelita Blackshear Dalton, a General Session judge. A panel of 12 lawyers vetted seven applicants for the judgeship that handles serious criminal cases on the 6th Floor of the Birch Building. Governor Haslam will meet with each of the three candidates before announcing his decision. But no matter which way that decision goes, the Tennessee Tribune is proud to announce that Nick Leonardo is our 2017 Councilman of the Year. The city needs more like him. Next articleLaDonna Boyd Appointed President/CEO and Chairman of R.H. Boyd Publishing, Corp.